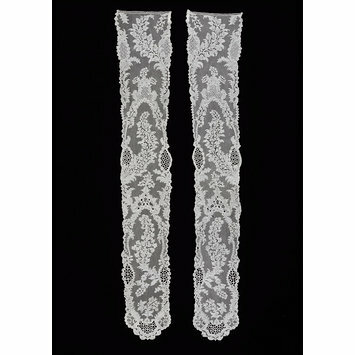 These lappets formed part of a headdress, known as a ‘lace head’ in the 18th century. It was composed of a curved panel, the cap back, to which two long streamers were attached, called lappets. The whole ensemble was finished with a lace frill. The lappets might be pinned up on top of the head in pleats, but more usually were left to hang loose, fluttering with the slightest movement. Among the various items of fashionable dress for which lace was used in the 18th century, the lace head was a particular focus for the display of wealth and taste. The quality of the lace, the excellence of its design and fine workmanship, and thus its likely expense, would be immediately apparent to observers. 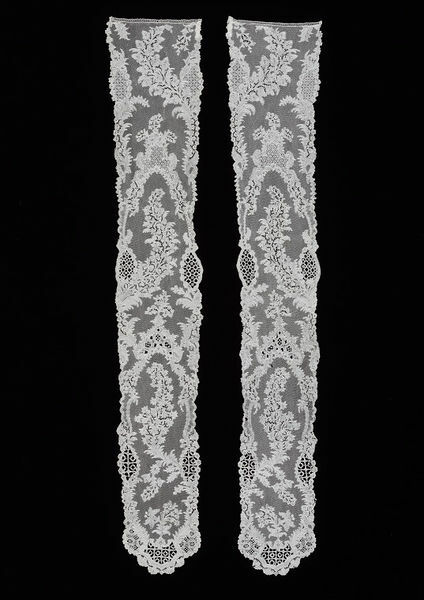 Pair of lappets, the motifs in needle lace on bobbin-made ground. The design is of trailing flowers in a formal arrangement on an open ground, with areas of different diaper-patterned fillings. The ends are curved and gently scalloped. There is a bobbin-made footing. Among the items of fashionable dress for which lace was used in the eighteenth century, lappets were a focus for the display of wealth and good taste (these were long streamers hanging down either side of the face, attached to a cap-back and frill, the whole ensemble known as a lace head) . Their design and shape changed during the first half of the century, corresponding with fashionable textile design, and in particular the influence of the rococo style. It was Flemish lappets that matched silk designs most closely, as they were worn by the most fashionable women, and were seen in close proximity to high quality patterned silks. The chinoiserie elements of rococo were particularly favoured by lace designers, and from the 1740s to the late 1760s were of prime importance. In the second half of the century, as silk designs simplified, lace designs were similarly reduced in scale, and lappets became mainly composed of areas of expensive net sprinkled with tiny floral motifs. The city of Brussels is usually associated with fine bobbin lace, but needle lace of high quality was also made there, competing with French lace in the market for customers. Brussels needle lace, such as these lappets, was characterised by the variety of fancy filling patterns in its motifs, and the exceptional fineness of its linen thread, making it light-weight and delicate. This delicacy was a quality particularly sought after in lace lappets, which were intended to flutter loosely around the face, and let the light shine through their semi-transparency.